Spain’s Iese Business School has achieved the best performance in the Financial Times rankings of executive education programmes, coming closest of any school since the survey was launched in 1999 to topping both rankings. Iese not only held on to top place in the ranking of customised programmes aimed at corporate customers, but also climbed one position to second in the ranking of open-enrolment programmes . In doing so, the school also tops the 2016 FT combined ranking of the leading 50 schools for executive education, calculated from both tables. Swiss school IMD climbs to second place after coming third for four years, relegating HEC Paris into third. Executive education offers non-degree programmes, either tailor-made for corporate customers (customised) or available to all working managers ­(open-enrolment). This 18th edition of the FT’s executive education rankings includes the best 85 customised programmes and the best 75 open programmes worldwide. The rankings are based on criteria including participants’ and clients’ satisfaction, the diversity of participants and faculty, as well as the schools’ international teaching and students. HEC Paris remains in second place in the customised ranking, a position it has held since 2009, while Duke Corporate Education completes the podium. Antai College of Economics & Management enters the top 10 on its second participation in the ranking of customised programmes, jumping six places to ninth. The Shanghai school came top for value for money and likelihood of future use. Alliance Manchester Business School continues its progression, rising 12 places to 36th. Five schools were ranked for the first time, with the highest new entrant, the University of Tennessee at Knoxville, entering in 45th place. The ranking of 75 open-enrolment programmes was led by IMD of Switzerland for the fifth year running. Both Iese and Harvard Business School moved up a place to second and third respectively, benefiting from HEC Paris’s fall of six places to eighth. 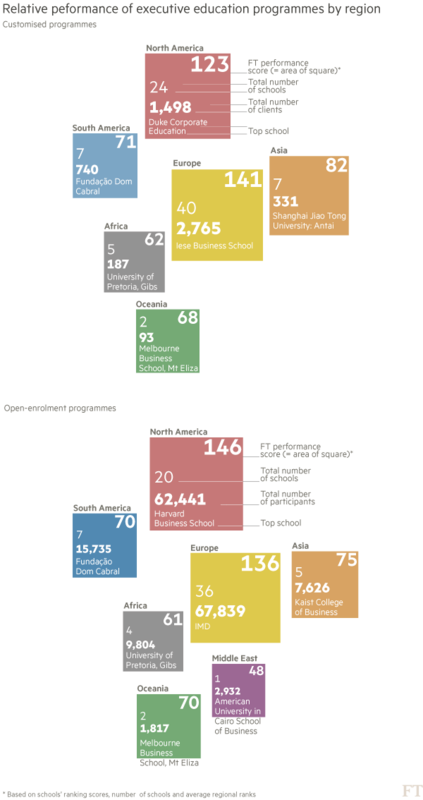 Questrom School of Business in Boston recorded the biggest rise, moving up 27 places to 35th, while the UK’s Cambridge Judge Business School climbed 18 places to 32nd. Only three schools feature for the first time, with Ireland’s Smurfit Graduate Business School highest in 69th place. European schools occupy the top two places of each ranking. Harvard Business School in the open ranking and Duke Corporate Education in the customised ranking are the top North American schools, both in third place. How do the regions compare overall on performance? The relative strength of each region (shown in the graphic) is calculated by averaging school ranking scores then adding the total scores by region divided by the average rank. The relative scores show North American schools as a group fare better overall than their European counterparts for open-enrolment programmes, while European schools stay ahead for customised programmes. Asia comes third in both cases, followed by South America, Oceania and Africa. In each of these last three regions, one school dominates in executive education. Fundação Dom Cabral near Belo Horizonte in Brazil, Mt Eliza Business School in Melbourne and the Gordon Institute of Business Science in Pretoria lead their regional peers in both rankings.